When do you set up art activities for your kids? When mine were younger, I’d do them at various times of day. Mornings were always good for us, but I’d try to have something simple up my sleeve to do at transition times, such as after lunch or nap. 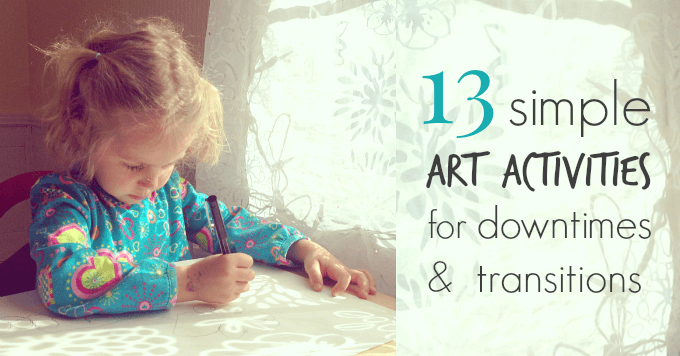 Here are some simple art activities that work well for after school or other transition times. These are low-key, low-mess activities that generally require a minimum of set-up, a minimum of adult involvement, and a minimum of clean-up. So there you have it. 13 simple art activities for kids that are great for downtime and transitions between activities, times of day (mealtime, naptime), or locations (school, errands). Plus, here’s a bonus one… If you have a spin art machine (we got ours on Amazon for about 10 bucks), spin drawing and spin painting can be remarkably calming and mesmerizing. My kids love both and often gravitate to the spin art machine after school. And if you want a printable to hang on your fridge or cupboard door as a reminder for some of these ideas, check out this post on 10 Simple Art Activities to Set Up for After School. This is a great list! My kids love to build “grape sculptures”! It sure makes it easier to fit art into our kids’ busy schedules, between homework and after school activities, when the art projects are quick to put out and easy to clean up! Thanks for sharing! So glad you like these ideas, Marieke! I wish I would see boys not girls depicted in art activities on your site. Both my parents were talented in art and my brothers and I would always be involved at home growing up with drawing, painting, sculpture etc. My father and brothers were strong men, army, hunting, sports etc. and my 23 year old nephew in fact, graduated college with a masters degree in graphic design and now lives and works in LA. I taught art K-12 in my long tracing career, as well as being a parent. I also have a daughter who teaches art. I think your photos should include boys engaged in creative activities. Art leads to higher level thinking and leads to jobs in many areas. I have two grandsons now and their parents think the arts play a role in their development as much as academics or sports or anyother activity. Hi Barbara. Thanks so much for sharing your thoughts. This gender balance is definitely on our minds at The Artful Parent. Jean happens to have two daughters, so many of the activities she does and photos she takes and uses on The Artful Parent happen to be of her daughters (and their friends, many of whom are also girls) engaged in art activities. I’m the project manager at the Artful Parent, and I am also a former preschool teacher (and the mom of a boy); I can definitely agree wholeheartedly that art is for EVERYONE! All kids love to be creative (just as all kids enjoy building, playing with legos, wearing tutus, playing soccer, having dance parties, etc.) We have loved having boys as well as girls in our art groups at The Artful Parent, so you’ll see that reflected in Jean’s posts about activities we do with that group. Thanks for noticing and mentioning this and for embracing that art and creativity are for all kids. I love your ideas you’ve shared today, thank you. I’ve been struggling to find something for my 3yr old to do during rest time that lasts longer than 2 second and doesn’t require input or supervision by me. I’ll give some of these a go.Any more suggestions for 3yr olds? I have used many of these. good job. I would say however that the string pulls could be less messy if the two ends of the string are not put in the paint and you use something to squeeze the paint off before starting out.